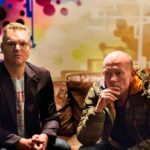 Erasure (Vince Clarke and Andy Bell) have today announced details of a brand new album, The Violet Flame, out on 22 September 2014 with a worldwide tour in autumn. Recorded in New York and London and produced by Richard X, The Violet Flame follows 2013’s critically acclaimed Snow Globe, and is the band’s sixteenth studio album release. The first single from the 10-track album will be released in mid July. The Violet Flame Tour then begins in Miami on 12 September and the band return to Europe on 8 November for a tour that includes London’s Forum on 14 December. After a show in Las Vegas on Hallowe’en, the year ends with two shows at New York’s Terminal 5. Tickets are on sale to the general public from 30 May (UK & Europe) and 7 June (US). See CONCERTS for all the dates and onsale information. The Violet Flame is available for pre-order from 10am (UK) on Wednesday 28 May from Pledge Music. The album will be available alongside exclusive Erasure bundles including single, deluxe and box set formats as well as a VIP ticket bundle which will feature the album, premium ticket and opportunities to meet the band. More details about ‘The Violet Flame’ when we have them!